I might be let go. In custom made dominant species. For the angels of calculus that might divinely support it. Ken Poyner’s latest collection of short, wiry fiction, Constant Animals, and his latest collections of poetry—Victims of a Failed Civics and The Book of Robot—-can be obtained from Barking Moose Press at www.barkingmoosepress.com, or www.amazon.com, or Sundial Books at www.sundialbooks.net. He often serves as strange, bewildering eye-candy at his wife’s power lifting affairs. His poetry of late has been sunning in Analog, Asimov’s, Poet Lore, The Kentucky Review; and his fiction has yowled in Spank the Carp, Red Truck, Café Irreal, Bellows American Review. www.kpoyner.com. 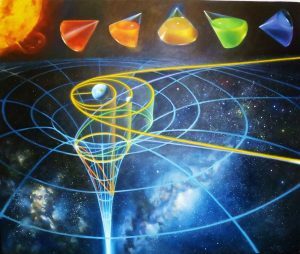 Editor’s Notes: Artwork is an oil painting by Sascha Grusche (Creative Commons Attribution-Share Alike 3.0) of conic sections, which describe possible orbits/trajectories of small objects around the Earth. A projection of these orbits (yellow) onto the gravitational potential (blue) of the Earth makes it possible to determine the orbital energy at each point in space. Isaac Newton, who proved that orbits were conic sections, is shown next to the Milky Way, our galaxy. The spectral colors symbolize different energy values, in analogy to the frequencies of light. us, the night flickers orange. 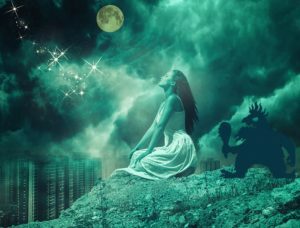 tor’s Notes: The dreamy image of a girl praying in the clouds (static pexels, CC0) is enhanced by adding the moon and a surrealistic troll. Three months she stayed with me . . .
A season all our own. As if the storm within her were without. The wives and mothers of our village shunned her . 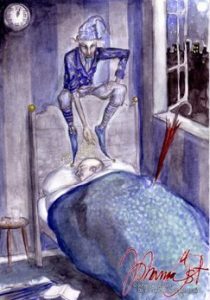 . .
Kendall Evans’ stories and poems have appeared in nearly all the major science fiction and fantasy magazines, including Asimov’s SF, Analog, Abyss &Apex, Weird Tales, Strange Horizons, Weirdbook, Mythic Delirium, and many others. He is the author of the novel The Rings of Ganymede and a number of chapbooks, including Poetry Red-Shifted in the Eyes of a Dragon; Separate Destinations and The Tin Men (both written in collaboration with David C. Kopaska-Merkel), I Feel So Schizophrenic, the Starship’s Aft-Brain Said and In Deepspace Shadows. Kathleen A. Lawrence has recent poems appearing in Eye to the Telescope, Altered Reality Magazine, Popcorn Press’s Lupine Lunes anthology, Rattle (online), Crow Hollow 19, haikuniverse, and other venues. She won third place in the Short Form division of the 2016 Science Fiction Poetry Association contest. Kathleen was Poet of the Week at Poetry Super Highway during January 2017. 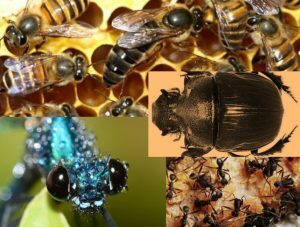 Editor’s Notes: The image is a collage of a scarab beetle, black ants (shutterstock), and a dragonfly (Pixabay). stridulations scraping on his carapace. as he advances through her silken web. his flesh a gift for children he won’t know. 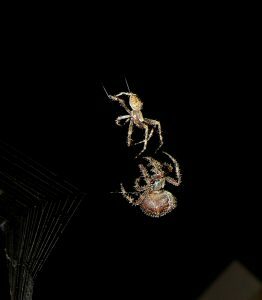 he sings desire to his eight-legged queen. yet he dreams of more than sacrifice. death might reward his gentle overtures. Deborah L. Davitt was raised in Reno, Nevada, but received her MA in English from Penn State, where she taught rhetoric and composition before becoming a technical writer in industries including nuclear submarines, NASA, and computer manufacturing. 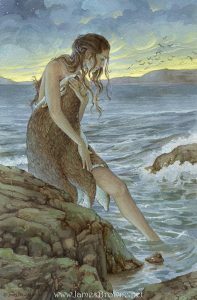 She had poems published in Silver Blade, Star*Line, and many other venues. Her short stories have appeared in InterGalactic Medicine Show and Compelling Science Fiction, and her Edda-Earth novels are available on Amazon. She currently lives in Houston, Texas, with her husband and son, and has a history of writing affectionately about spiders, in spite of her arachnophobia. For more information, please see www.edda-earth.com. closing our ears with a flood of dark. stumbling in the aisles, whispering angrily. their robes ballooning with hot air. of mountains, crumbling like a fossil spine. We will cross them safely into another country. 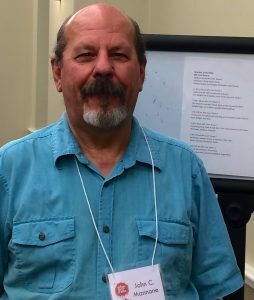 F.J. Bergmann edits poetry for Star*Line, the journal of the Science Fiction Poetry Association (sfpoetry.com) and Mobius: The Journal of Social Change (mobiusmagazine.com), and imagines tragedies on or near exoplanets. Her chapbook A Catalogue of the Further Suns recently won the Gold Line Press manuscript competition. 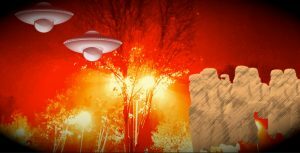 Editor’s Notes: From publicdomainpictures.net, the fiery “lord of darkness” is combined with saucers and stormtroopers. Wedged in the captain’s chair, our thighs pressed together, the scream of klaxons making my wife’s words impossible to hear (our lips move I love you I love you) the arm of the chair digging into my side, my hands clenched on the transmitter . . . – – – . . . SOS . . . – – – . . . her hands white-knuckled on the yoke, pulling, pulling. The crash is a tooth-jarring jolt, a sudden stop to flight, then smoke, darkness, more smoke. Two inter-solar spies climbing out of the twisted wreck, becoming like two women happy to be alive. Lucky, kissing her over and over, holding each other. Laughter. Breathable atmosphere, green mountains, white beaches, blue water. The information we stole from the enemy was still intact, encrypted under our SOS for Command to find us on this out-of-the-way paradise world, with trees like palms, heavy with something like coconuts, and a sea teaming with something like fish. My wife, restless, always building, salvaging, discussing enemy plans, until I wrap her hands in mine and tell her to look around us. For the first time in our marriage, danger is far away, life does not seem so short and desperate, and we are surrounded by peace and beauty. So we lay down our burdens of duty for a little while, eat charred flesh and lick the grease from our fingers, make love in the sand, and start to really know each other, waiting for a rescue neither of us is quite sure we want. When Command arrives to fly us back into war, my wife takes my shaking hands in hers and tells me as long as we remember to pause, and look around, we will always find this place together. And she is right. 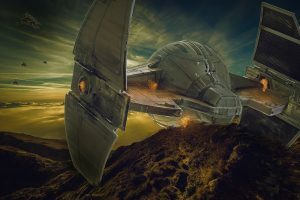 Editor’s Notes: A spaceship (Pixabay 1839722_1280), crash landed on an alien world, creates that sense of desolation in this love prose poem. in each of our beaks. to emit their own light. Melissa Frederick is a writer and freelance medical editor from suburban Philadelphia. Her poetry and prose have appeared in numerous publications, including Crab Orchard Review, DIAGRAM, Strange Horizons, Mythic Delirium, Goblin Fruit, Spectral Realms, Mid-American Review, Mithila Review, Heron Tree and is forthcoming in Oxford Poetry. Her chapbook, She, was published by Finishing Line Press in 2008. Follow her on Twitter at @msficklereader. it was entirely, acutely self-aware. peel per 9 billion dragonfly flaps. for a while longer, just because it could. at variable speeds until it found one it liked. Michael Kulp is a writer and father of two mostly grown children who have survived his shenanigans through smarts they inherited from their mother. His creative nonfiction, fiction, and poetry have appeared in consumer magazines, newspapers, and literary journals. His first book, Random Stones: A book of poetry was published in 2016. His work has been included in the following venues: Adventure Racing Magazine, Ancient Paths Literary Magazine, The Backwoodsman, Barrow County (GA) News, Blink-Ink, Bushcraft & Survival Skills Magazine (UK), Firefly Magazine*, Friday Flash, Fiction, Gravel, Gyroscope Review, Haiku Journal, Ink, Sweat & Tears*, KEROSENE 2012—Burning Man in New York City, Microfiction Monday Magazine, Micropoets Society, Stripped Lit 500*, Three Line Poetry (anthology), Travel Thru History, We Said Go Travel, Where the Mind Dwells (anthology), Yellow Chair Review. 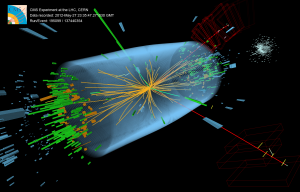 Editor’s Notes: To complement “How It All Started,” the image was chosen from the paper, “Observation of a New Particle with a Mass of 125 GeV.” The event was recorded with the CMS (Compact Muon Solenoid) detector* in 2012 at a proton-proton center of mass energy of 8 TeV. The event shows characteristics expected from the decay of the SM Higgs boson to a pair of Z bosons, one of which subsequently decays to a pair of electrons (green lines and green towers) and the other Z decays to a pair of muons (red lines). The event could also be due to known standard model background processes. *The LHC (Large Hadron Collider) smashes groups of protons together at close to the speed of light: 40 million times per second and with seven times the energy of the most powerful accelerators built up to now. Many of these will just be glancing blows but some will be head on collisions and very energetic. When this happens some of the energy of the collision is turned into mass and previously unobserved, short-lived particles – which could give clues about how Nature behaves at a fundamental level – fly out and into the detector. CMS is a particle detector that is designed to see a wide range of particles and phenomena produced in high-energy collisions in the LHC. Like a cylindrical onion, different layers of detectors measure the different particles, and use this key data to build up a picture of events at the heart of the collision.